As a homeowner, it's your job to make sure your property and family are protected from mishap. It's difficult to predict when you might have a problem and even more challenging to know what to do once it happens. Basement waterproofing is a project that falls into that unknown area between "I think I might have a water problem" and "My basement's flooded; now what do I do?" While early detection is critical to reducing the health and financial risks associated with water damage, you may need help in determining potential concerns and methods of waterproofing. First, you'll want to find out if you actually have a water infiltration problem. Puddles on the basement floor, damp spots or the presence of a white chalky substance on the walls, cracking or bowing walls, peeling paint, warped paneling or a wet carpet in finished areas, or a damp, moldy odor are all signs of water damage that shouldn't be ignored. Finding problems early can be accomplished with regular inspections, especially after a hard rain. If your foundation walls and floor are covered, you may need to remove paneling or carpeting to see if moisture or mold is present. If you discover moisture or leak in your foundation, don't panic. Concrete is a porous material that is susceptible to cracking from hydrostatic pressure underground. 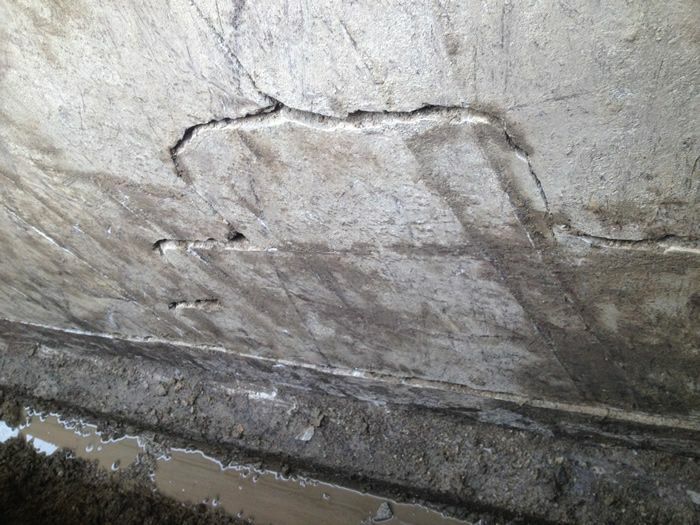 To gain a better understanding the type of situation you have, read the Complete Homeowners Guide to Foundation Cracks. It will give you insight into the causes and when to consider hiring a professional. 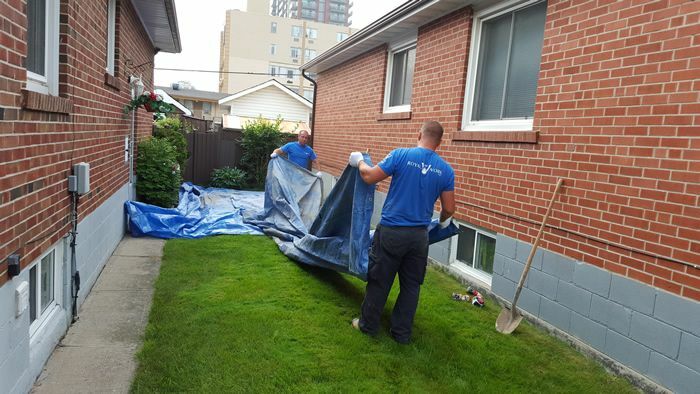 Even if you're not sure you need remediation, contacting a professional waterproofing company like Royal Work Corp. Waterproofing can provide peace of mind. In addition to providing a free inspection of your basement, a licensed contractor will have the expertise and skills needed to perform any needed waterproofing. Each basement waterproofing project is unique, and the solution to your problem should be designed specifically to rectify it. While you may be tempted to save money with a DIY project or a low-priced contractor, the cost of a botched or inadequate repair could cost thousands later on. Dependent on your situation, all three options can be viable solutions. Fix wet basement problems permanently saving time and money by hiring experts from Royal Work Corp. Waterproofing. 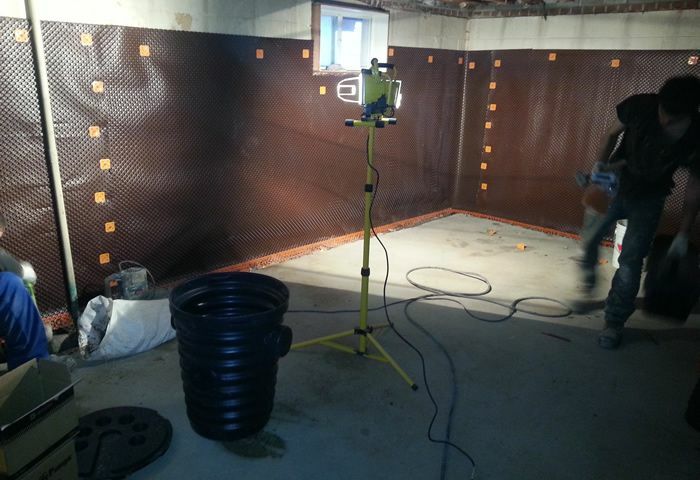 Many of today's basement waterproofing methods are less invasive than previous practices. In some cases, vertical wall cracks can be repaired externally by digging a hole the width of a bucket to access the crack. Utilizing video cameras to inspect clogged drains can reduce the need for tearing up the entire length of pipe to discover the problem spot. 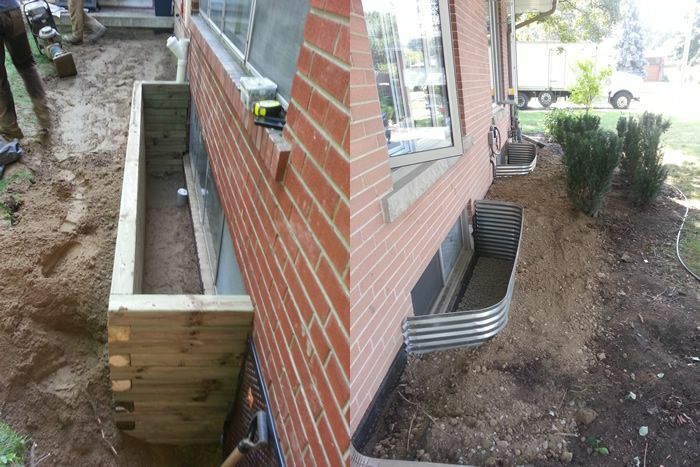 Unfortunately, there are some complex repairs that can only be rectified by substantial excavation work. Before giving the go-ahead, consider where the affected area is in relation to the main household activity, if there will be any disruption in water or other services inside the house, and set up a game plan for driveway access and car parking. All that dirt has to go somewhere while the repair is being completed. You may want to look into alternative living arrangements while the work is being done. Having any work performed in your home can be inconvenient. 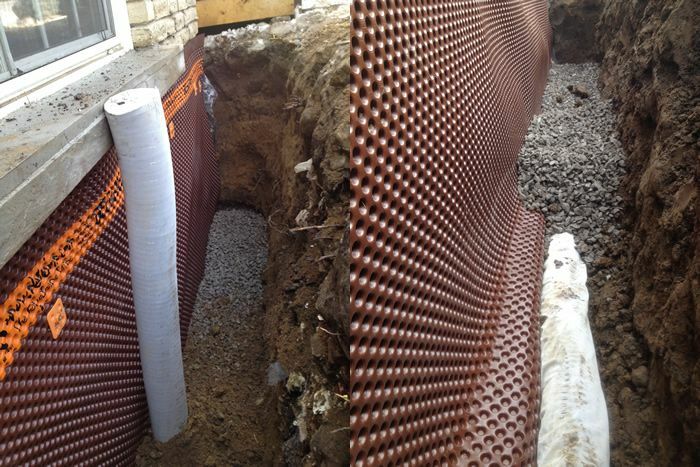 Basement waterproofing systems can take anywhere from one to four days and sometimes longer. It's recommended that you delay party planning or other special events until after the work has been completed. Planning for the unexpected, like adverse weather conditions, a greater problem than first thought, or difficult ground conditions can all extend the original proposed schedule. Unless the situation is a dire emergency, discuss the optimum time for completion with your waterproofing contractor. Finished basements where water infiltration is hidden can be destroyed. Paneling and flooring can warp, furniture can become mildewed, and floor tile can lift or carpeting ruined. Foundation cracks can attract termites and other insects. The structural integrity of your home can be compromised. Water or moisture close to your electrical panel, furnace and hot water heater can be dangerous. A wet or damp basement can lower the value of your home by 15 to 25 percent. The cost of materials and services is constantly changing. Prices rarely go down, so expect the longer you delay, the more expensive the project will be. Mold can overtake your home and cause serious health concerns to you and your family. Allergic reactions are common and can display symptoms like skin rash, itchy eyes, runny nose, coughing, sneezing and respiratory ailments. Long-term exposure can lead to more serious health concerns. The longer you wait, the higher the odds that your basement will eventually be flooded, and its contents will be damaged or lost. Putting off the work until you have enough money to cover the entire expense may take longer than you expect. Discuss financing options with your contractor to complete the necessary work now rather than later. The best method of basement waterproofing is by preventing water from building pressure on exterior foundation walls and entering in the first place. Drain tile installed inside or outside the foundation rarely requires maintenance and will keep your basement dry for years to come. When you consider whether to add interior or exterior drain tile, take a look at the work space. If your basement is unfinished and being used primarily for storage, an interior solution would be recommended. If you have beautiful landscaping around the perimeter of your home that took years to establish, an interior solution would also be recommended. Of course, if you have a beautifully appointed, finished basement and landscaping outside, your decision will be more difficult to make. Also referred to as “negative-side” waterproofing as it handles water that has already entered the basement. It is recommended to address increasing pressure from a rising water table. Also known as hydrostatic pressure, water (often caused by heavy rains or snow-melt) may be seeping into your basement through the cove joint between the wall and floor or through floor cracks. Many homeowners opt for this method as it’s less expensive and invasive than the exterior process. A typical project includes the excavation of a trench around the inside perimeter of your basement. Drain tile pipes and gravel are installed to route water to a sump pump system. The sump pump will then discharge water through a pipe to the exterior of your home. Drawbacks include breaching the concrete basement floor, the disruption of finished areas, noise and dust. In addition, if your sump pump malfunctions during heavy rains, there is still a potential for basement flooding. Also referred to as “positive-side” waterproofing as it addresses the source of water or pressure before it infiltrates the basement. This process can be more aggressive and more costly than other methods as it involves extensive excavation. The number of exposed walls needed will be dependent the number of areas affected by water infiltration. Excavation along the wall to the foundation footer (approximately 6 to 8 feet down) will provide access to repair cracks, install a waterproofing membrane and either install new drain tile or repair existing pipes. The drain tile sits in a gravel base to capture excess water, so it never penetrates the foundation wall. Your home’s landscaping, driveways, sidewalks and porches may be affected. You should ask your contractor for a detailed assessment of the impact to your yard when the job is done. 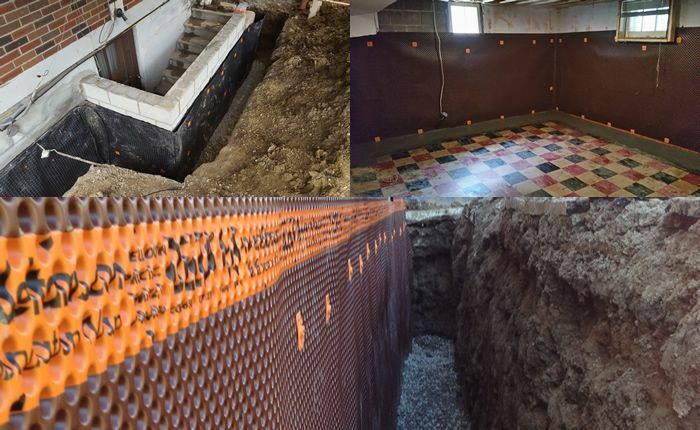 The expense can be significant, but it offers a comprehensive approach to complete basement waterproofing. When deciding what type of waterproofing methods to pursue, it’s important to consider how you plan to use your basement space in the future. Are you thinking of finishing all or a portion of the area? Was it finished previously but sustained water damage? If so, will you replace it, upgrade it or abandon it altogether? How long have you lived in the home? Are you considering a move soon or do you plan to be there for several more years? Even if you don’t have a major water problem now, answering these questions can help you determine just how far you want to take your basement waterproofing project. Remember, once you cover the concrete walls and floor, you may not discover a leak until your finishes are damaged. If you’re planning to sell your home in the near future, it’s even more important to take care of any water problems in your basement. Statistics have shown that homeowners who have invested in sound waterproofing and have a dry basement will increase their home’s value by up to 20%. With that type of return, the repair will be well worth the expenditure. By taking a proactive approach and applying careful consideration to all these points, your basement waterproofing project will increase your home’s value and provide years of enjoyment. 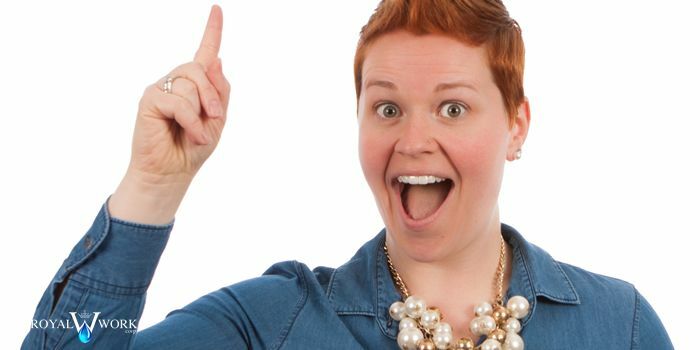 Remember, if you find moisture or water problems in your home, don’t panic. Contact the professionals at Royal Work Corp. for a free waterproofing evaluation. Our experts will give you the guidance and peace of mind to find the right solution for your needs.